We are entitled to fish! 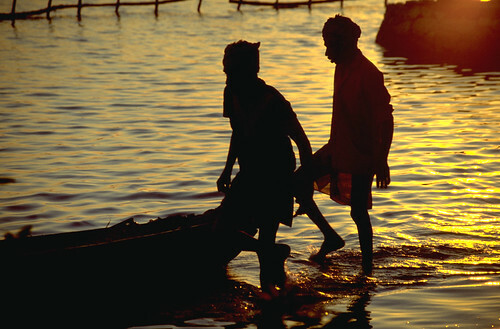 Two Indian fishermen went out to sea in a little boat. Matta was a very good man. He was a good son, a good husband and a good father to his two children. He was not given to the alcoholism that characterised the fishing communities along the coast. He didn’t even smoke beedis. He was frugal in his habits but not miserly. Yet such was his lot that he couldn’t put away any money by way of savings. Life, literally, was a day-to-day affair. The well-being of his entire family depended on his ability to catch fish. Kutty, his childhood friend, was his inseparable companion. While not brimming with virtue, and even after accounting for his tendency to become cynical, Kutty was also a decent man. He had only his own mouth to feed so he didn’t need to catch all that many fish. The sea off their village was not teeming with fish, but it had long sustained the dozen or so hamlets that dotted the bay. Winters were more bountiful than summers and there would be days in spring where the fish would very nearly jump out of the sea and into the boats. But there would also be days when it would be hard to spot so much as one seer fish for hours of trying. The two fishermen were unhappy: Matta, because he couldn’t catch too many fish at all, and Kutty because he knew others could. Matta would not attach a bait to the end of his fishing line. And he wouldn’t take his boat into the waters beyond his own village because he believed that would be wrong. The fact that boats from other villages entered his own waters didn’t change his mind, for he argued, two wrongs don’t make a right. He held to his steadfast conviction that he deserved the fish because not only because he needed them, but also because he was a virtuous person. He was, he firmly believed, entitled to the fish. So he would be surprised when he came home in the evening with a few small fish or none, while that Beoda next door hired half-a-dozen hamals to offload his catch. And he would be surprised frequently, sometimes as many as seven times in a week. Kutty, who left the actual fishing to Matta, lamented that their boat was old, the fishing rod was not long enough and their nets let the fish slip out. He complained, often to Matta but mostly to himself, that they were too busy to repair their boat and too poor to buy a new one. One of Kutty’s favourite hypotheses—and he had many of these—was that people who lived to the south of the big mango tree were bad at catching fish. Kutty also blamed the village panchayat and the fishermen’s union for a variety of reasons, including being comprised of several people who lived south of the said mango tree. “Something has to be done about all this” he would say often, always in the passive voice. Author Nitin PaiPosted on 4th April 2010 4th April 2010 Categories Aside, Foreign AffairsTags acad, foreign policy, international relations, story4 Comments on We are entitled to fish!